I see that I had gotten the "Castle Gargantua" pdf. Looks like there will be a lot of prep work if played on Virtual-Table top. I would roll up all the areas before-hand and make the maps and add the monsters, beforehand, even for real-table top play. At least the abstract art in this book is an improvement over the "Maze of the Blue Medusa" module. I rolled a whole sheet of the various die rolls (you roll a d4, d6, d8, etc.) and just used that, but for the rest I went by the book as we went. The idea with the map drawing is to let the players do it from the description - if they get it wrong, just go with it. If it refuses to join up, the characters must have mapped it wrong. This book really works if you do old-school mapping. I forgot about Castle Gargantua. I have that, I need to look it over. 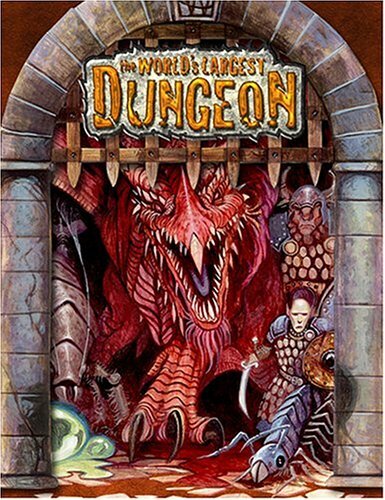 This Mega-Dungeon just came to my attention as it was put on Sale today! 60% off! Currently just $1.66 for PDF or $12.44 with Softcover. Just got the "Gloamhold" Campaign pdf. On a first quick glance. 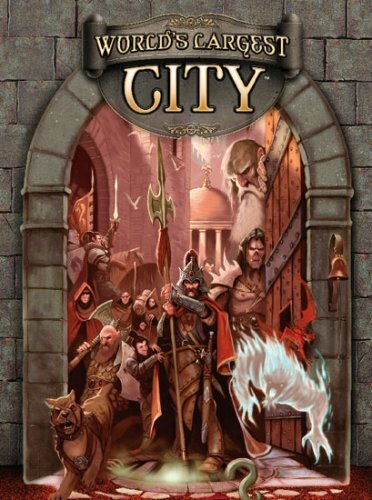 It's basically a summary for what could be a much larger and truer, full featured mega-dungeon game module. There is a side map of what the adventurers are supposed to explore, but no maps of the actual dungeons itself. No wonder it's so cheap! Here is a MegaDungeon from PaceSetter Games, called "Cataclysm at the Acaeum". Looks like the KickStarter for it ended December 2012 and originally scheduled to come out May 2013, but still has not yet been released! Anyone have an update on this one??? I'm afraid that this is the first I've read of this one. Sorry. Interesting, I have not heard of this either. Surprised I haven't seen people taking up pitchforks and torches for a kickstarter that late. I've been watching a 5e one that is only like 2 months late and the toxicity is already out the roof. I remember M&M still hasn't been delivered to everyone yet, and I know I still have resentment to that. Are the comment section public in its KS page? Here is "The Forbidden Caverns of Archaia". It is the sequel to "Barrowmaze: Complete", both by Greg Gillespie. I had gotten the book from the Kickstarter and it is a good one! Wait, it's a sequel? How does anyone live long enough to need a sequel to Barrowmaze? Yea, though, it does start at level 1 again, so you could start over. However, I intend to let any surviving characters from Barrowmaze continue into Archaia. They would be around level 15 and I guess they could get up to level 25 in Archaia. Then I'll run them through a series of Immortal level modules. The first issue of Megadungeon is upon us! Dungeon adventures, NPC's, and resources suitable for any campaign! Dual-statted for B/X and 5e. Come explore Numenhalla, the god halls. Learn about the altars and the logos, see the ettercop lair. Articles on the pillars of megadungeon play, and using 5e and the megadungeon! 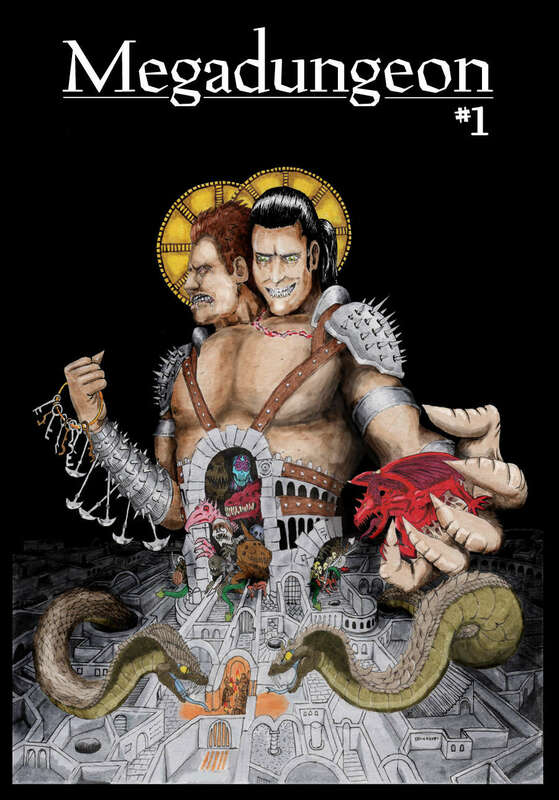 Heavily illustrated by the talented OSR artists, Sam Mameli, Todd McGowan, and Kent Miller!